New York: Wall Street stocks plunged Tuesday on worries about US economic growth and revived doubts about trade wars as the Trump administration sent mixed signals on their detente with China. A day after global stocks rallied on a weekend US-China announcement suspending new tariffs, international markets mostly pulled back as investor focus shifted to the lack of concrete progress in reaching a long-term agreement to the dispute. 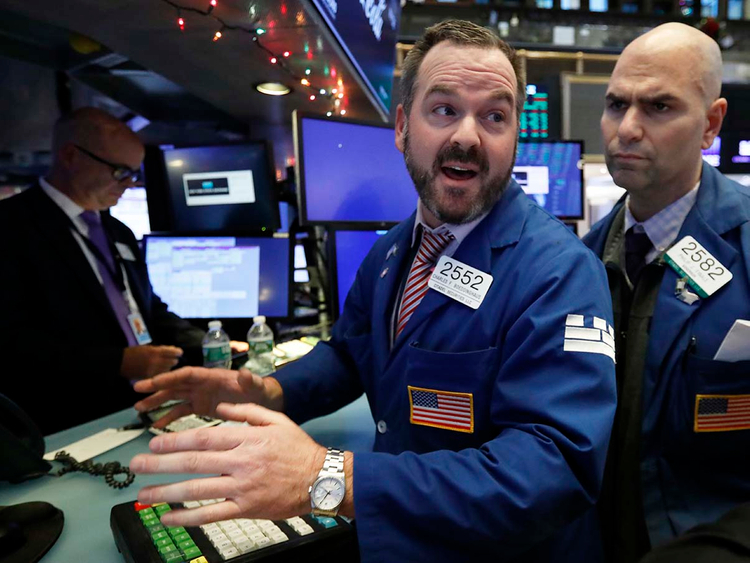 All three major US indices fell at least three per cent, with the broad-based S&P 500 diving 3.2 per cent to 2,700.06, leaving it barely positive for the year. Bourses in London, Paris, Frankfurt and Tokyo also fell. Trump, abruptly shifting tone from the weekend emphasis at comity with China, signaled he was more than happy to impose tariffs if a “fair” deal with the Asian giant did not materialize. In another trade matter, Trump attended a White House meeting with German automakers as the US and European Union work to resolve US complaints about the trade deficit between the two economies. The US president has for months been threatening tariffs on imported autos, which would primarily hit Germany, but in July pledged not to take any steps against the European Union while efforts to reach a resolution were underway. Investors also cited a signal in the US bond market, often seen as an early-warning indicator of a US recession, as a catalyst for one of Wall Street’s worst days of the year. The shift comes amid signs of weakening global growth and mounting expectation of a slowdown in the United States. Most analysts still do not expect a US recession in 2019. A note from S&P Global Ratings said the US was nearing the “latter” stages of a multi-year growth cycle, predicting that US growth would slow from 2.9 per cent in 2018 to 2.3 per cent in 2019 and 1.8 per cent in 2020. “If history is a guide, the end to this cycle will likely result from some combination of the bursting of an asset-price bubble, an oil-price spike or a misstep by the Fed (which has been known to tighten monetary policy either too early or too late),” S&P said. Elsewhere, Britain’s Brexit quagmire is coming to a head as lawmakers debate Prime Minister Theresa May’s exit deal over the next five days. In a setback for May, the House of Commons voted 311-293 to force the government to publish the full legal advice it received from the attorney general about the divorce deal May struck with the European Union last month. A defeat for the prime minister next week in the overall plan could trigger a no-confidence vote leading to early elections, leaving the Brexit process in utter chaos.